Osama, Saddam and their followers are bad actors and will get what they deserve, probably mostly from our superb military. If the Pentagon’s map is more urgent, the Peace Corp’s is, perhaps, in the long run the most important… What happens in India, Africa, and South America — whether the nations where the Peace Corps works succeed or not — may well determine the balance of peace. In the 60’s and 70’s then New York Senator Jacob Javits proposed a peace army of a million young men. Labor leaders advocated an overseas service corps of 100,000. The Peace Corps’ first Deputy Director, Warren Wiggins, said a Peace Corps of 30,000 — 100,000 was needed. The Peace Corps mean budget from 1965-69 was $108,000,000, with its mean number of Peace Corps Volunteers (PCVs) in the field numbering 13,947 with a mean cost per volunteer of $7,743. On the other hand, for that same period the Vietnam War Budget was $16,260,000,000. The mean number of soldiers we kept in Viet Nam was 413,300. The MEAN cost per soldier was $39,370. If just ten percent of the Vietnam War budget, $1,626,000,000, had been put into the Peace Corps budget to get Americans to work “the toughest job you’ll ever love that REALLY does good,” then an additional 209,996 mean Peace Corps volunteers could have served during that period. Imagine if we had continued inspiring 55,000 American volunteers each year to serve in countries where clean water doesn’t run easily, chalk boards are luxuries, people house themselves in mud, clay and cow dung padded walls, education is treasured, health and food is too often wanting. Instead, since its 1961 inception only slightly over 150,000 PCVs have served in over 130 nations. Had our Army of over two million PCVs already served in the field, do you think international newspapers would be lambasting America on its pages? Would readers buy it? Would Osama bin Laden and his cells have risen in such a world? Maybe. But having been a Peace Corps volunteer as well as a Global Village Habitat for Humanity homebuilder working near the struggling masses, I think not. Even most ivory towered policy wonks would probably agree. Yet, where on the political hustings, on the forums provided for perceived leaders, do you hear even some of them planting visions of common sense, of marshalling good-doers to address the sufferings of the world. The lines drawn between long suffering masses and terrorists and comfortable, arrogant Americans are short, and getting shorter. The line eraser is not a stealth bomber or more technically armed Special Forces. The eraser cleans when you build what an American Peace Army does – builds relationships, schools, sanitation systems, small farms and businesses. Sarge Shriver was right, in the long run the Peace Corps map of the world is more important. Today’s world reminds us how much more his words needed heeding. Unless the builder also grows. Some brother-in-laws think alike. 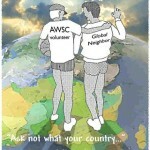 Their vision of a vastly expanded Peace Corps is what today’s unbuilded global village needs. Building a life for one’s loved ones forges a sense of pride, and that builds villages and cities beautiful. It’s what two visionary leaders preached. It’s what isn’t pushed enough today. Mill Valley resident, Dwayne Hunn, is field director for the National Initiative for Democracy Campaign, a proposed process to empower all Americans with law making capabilities. 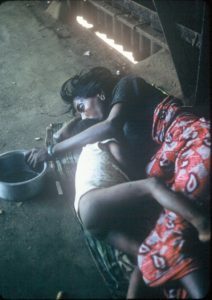 Hunn served in the Peace Corps Mumbai, India.